I had not listed any particular peaks for this scheduled trip, being open to negotiation. These generally work out pretty well. Rex was the only taker for this double peak climb along U.S. 395. He is a game companion, knowing our odds for success, and spectacular success, are pretty good. With our traditional fine, early breakfast in Mammoth Lakes, CA, we drove to the trailhead at Reds Meadow. Our peak this day was part of the vista. Taking the Muir Trail north, we turned left at a trail junction to go to Beck Lakes. There are many confusing trail junctions, so it is well advised to have a new topographic map. After several miles of hiking, more trail junctions are reached. Taking the trail toward Holcomb Lake, cascades and waterfalls are passed. When the trail heads away from the creek, we headed cross-country upstream. 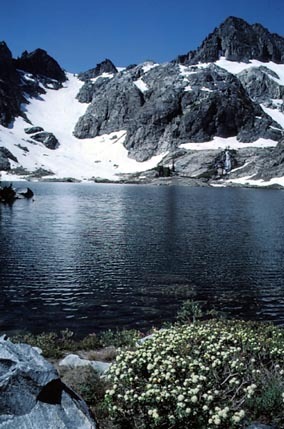 It is a mile to Ashley Lake. One should be an experienced wilderness navigator to do this. My first time, I was with a SPS group to camp, and then climb this SPS listed peak. Reaching Ashley Lake is a moment in itself. The setting is pristine and beautiful. A waterfall spills down on the far side of the lake, and the glacier route up the peak is obvious. We had ice axes, and tackled the snow climb with confidence and ease. It is not that steep, although there are small crevasses and rock moats to spot and avoid. Reaching the top of the glacier, and then the ridge, we went right on easy rubble to the summit. Our time to here was five hours. The view of the Minarets was awesome. Mt. Ritter and Banner Peak can also be seen. For Iron Mountain, there is presumably an easier route, from the south, although it is longer. The sky was clear, and this was a warm weekend. We read through the register. Another official, local chapter group suggested that one of them had made it to the top, earlier, in a two day trip. We didn't see the entry. Having a nice glissade back down the glacier, we navigated effortlessly back to the trail. We took a short side trip to the well-flowing, Minaret Falls. Back to the cars, we drove into Mammoth Town. After another fine meal somewhere, we camped and enjoyed the starry night. Heading north the next day on U.S. 395, we took the Lobdell Lake Road, with plenty of wildflowers, for another peak ascent up Mt. Patterson, the high point of the Sweetwater Mountains. This is a desert range that straddles the California-Nevada border. It is beautifully "barren," and is the site of several old mines. Essentially, a closed-off road leads to the top. My first time on this peak, with a local chapter group in 1975, had us climbing steep rubble in what they said was de facto wilderness. We then came to a jeep road! We had a challenging backpack out of it, but our precious wilderness was not to be. The register, then, reported that a VW bug had been driven to the top. I chose a cross-country route, after we had started incorrectly. 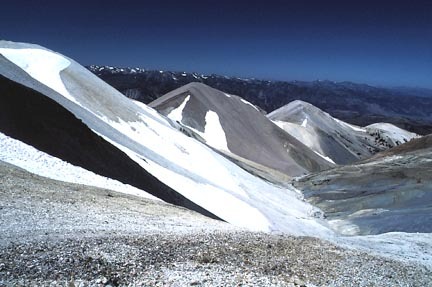 A ridge, with three distinct bumps, led to the summit ridge. We had such peakbagging fun to climb all of these high bumps. Rex used his hands to steady himself on the steep class 2 rubble. No registers were found, but we left a small cairn on each. These bumps all contributed maybe an extra thousand feet to the climb. The Mt. Patterson summit cairn and register was reached, after a few hours of climbing, for my second ascent. The views were nice, as usual. We were practically laughing our heads off by this multiple climb. While I didn't count these 10,000 to 11,000 foot bumps as peak ascents, many would. Only crazy people would do this, as if this all weren't insane enough! The weather held for all of these climbs. Often, in summer, a pattern of thunderstorms develops. You must be off the peak before the rain and lightning sets in. Many people have been killed by a lightning strike. Yes, it is far more probable than winning millions at Lotto. We descended by the road, and I kept notes. Driving out back to U.S. 395, we drove north out of the West Walker River Canyon. We arrived home, with plenty of time to get rested and ready, for another mundane week of work.